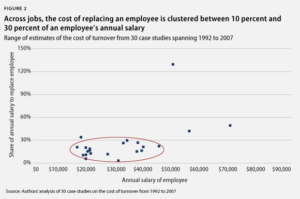 The costs generally rise by employee salary, making it very expensive to replace senior employees. Based on the data, you may achieve the best results by retaining and developing existing employees instead of simply hiring new ones. Your exact cost will vary by industry and geographical hiring markets, among other things. But the real costs involve the long and short-term impact on your organization. Letting go of current staff can mean lost productivity while waiting for new hires, training, and experience to get up to speed. Some industries also have higher turnover than others, which makes it even harder to retain new hires. Remember: there’s no guarantee that the promising new employee you just hired will stick around. If you’re dealing with frequent turnover, you may have a more fundamental problem that simply hiring new employees won’t fix. There are also significant time and financial costs associated with recruiting new talent. Costs include but aren’t limited to advertising, interviewing (recruitment), and training, with the costs of the first two rising sharply when competition for talent is especially fierce. Oh, and don’t forget: you can also miss business opportunities without the right people to solve specific problems (e.g. respond to RFPs). Moreover, when you’re understaffed, it takes a toll on morale, leading to disengaged employees (aka workplace zombies). To ensure that the workload is fairly balanced and your employees are fully engaged, consider workplace activities and employee incentives to motivate your team to perform well, day after day. The constant refrain of “turnover averages X% annually in our industry—always has” can take on an air of inevitability. We recommend you to reject general benchmarks like that and try to keep your employee turnover as low as possible despite the drumbeat of data. One proven way to retain top employees and attract new talent is to consistently recognize and reward them. People need to feel that their work is meaningful, and public acknowledgment of employees’ achievements lets them know that their colleagues appreciate their contributions. Whatever methods you use to raise your employee retention rates, make sure you measure your progress. You can’t improve what you don’t measure. If you need help designing, implementing, or running an incentive program to boost your employee retention rate, we should talk. We help some of the largest organizations recognize and reward their workforces, and are ready to do the same for you.